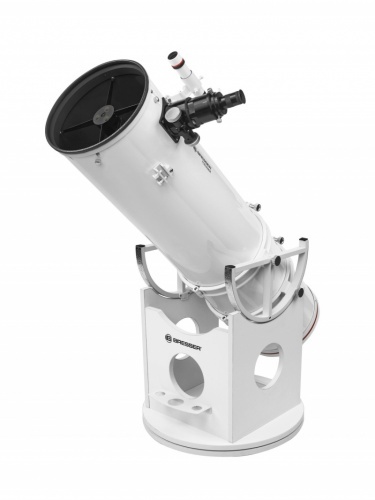 A Dobsonian design telescope offers the best value for money in terms of telescope purchase, and the Bresser Messier 10” Dobsonian delivers this and more. A 10” telescope offers an upgrade from an 8” of nearly 50% extra light gathering power, meaning brighter images, better resolution and greater colour saturation. Bigger aperture means better images: see more detail in Saturn’s rings and cloud belts on Jupiter, split globular clusters into individual stars, observe tenuous detail in galaxies and nebulae and see a host of objects that are simply invisible in smaller telescopes. Bresser’s design philosophy behind the Messier 10" Dobsonian Telescope puts the emphasis on quality core components and upgradability. The main mirror is made of H-PZ33 low expansion glass, in order to minimise cool down time. This primary mirror is ably mounted in a newly-designed cell with 9-point floating supports, which retains collimation well and is very simple to adjust. The secondary spider is thin enough to minimise defraction spikes, but substatial enough to support the secondard mirror assembly well. The telescope has a metal tube, which is strong and offers good stiffness in order to assist collimation retention. The Bresser Hexfocus 2.5” rack and pinion focuser offers class-leading support, due to its hexagonal cross section design, which results in no focusing flex, no matter what orientation the telescope is in the night time sky. This focuser has a heavy duty low profile rack and pinion focuser, which offers similar smoothness to Crayford-style focusers, without the potential for slippage that can occur with friction-based Crayfords at higher altitude under heavy load. Graduated measurements are inscribed on the exterior of the drawtube for precise focus measurement. A dual speed focus control for the Hexfocuser is also available as an additional, simple upgrade. The inclusion of a lockable focuser extension tube for visual use, once removed, enables the user to get to prime focus for astrophotography – a rarity in Dobsonian designs, meaning serious astrophotography is definitely an upgrade possibility. A good quality 25mm Super Plossl eyepieces is supplied as standard, giving a magnification of 51x. Additional eyepieces of both 1.25” and 2” barrel sizes can be used with this telescope and are available as an added extra, (practical maximum eyepiece focal length is 4.5mm, minimum focal length up to around 30mm). A 6x30mm finderscope is included, which allows for accurate pointing of the telescope, though this can be upgraded to Bresser's larger and more sophisticated 8x50mm illuminated finder. The telescope is supported on two large side altitude wheels, which are attached to two adjustable tube rings. These adjustable tube rings allow the instrument to be rebalanced under different accessory loads and also facilitates a straightforward upgrade path to mounting the OTA on a fully computerised equatorial mount at a later date, via a standard Vixen/Synta or Losmandy profile dovetail plate. The telescope mount is supplied flatpacked and can be disassembled and re-assembled easily for transportation storage.